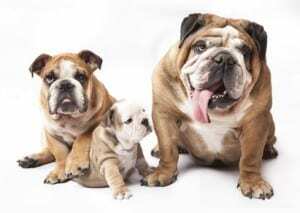 Could You Share Your Home with the Bulldog Temperament? In spite of its fierce appearance, the typical Bulldog temperament is that of a gentle and courageous dog. The term “Bulldog” is usually used in reference to the English Bulldog. This breed was created in early 19th century England to bait bulls, and at that time it was known for its aggression. However, careful breeding in recent years has removed that aggression and created an amiable and easy going dog. Other breeds of dog that are included in the Bulldog group are the American Bulldog and the French Bulldog. 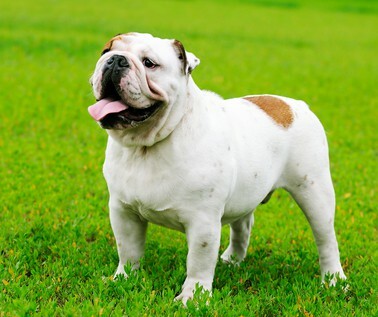 Many people don't consider the Bulldog when they are choosing a dog for their family. This is a shame because this dog's temperament makes them a wonderful pet. They are very loving and have almost endless patience when children want to wrestle and tumble with them. You can expect your Bulldog to almost demand cuddles, and they will take as much affection as they can get. Just be sure to have a towel handy; they produce an awful lot of drool! Bulldogs tend towards being lazy and are quite happy to snuggle up on the couch with you. They don't need much exercise, and too much exercise can be dangerous to them. Their short nose makes breathing difficult and they are prone to heat stress. This makes them perfect for apartment living, or for homes with a small back yard. If you are going to bring home a Bulldog, be prepared to have your dog living inside with you, and don't leave them alone for long periods of time. They don't like being left to their own devices for too long, and if they get bored or lonely, you can expect them to be quite destructive. If you are looking for a dog that is obedient and easily trained, then you will need to look elsewhere. The Bulldog isn't known for their intelligence or their trainability. In fact, they can be positively stubborn and even willful at times. In a study of the top 80 dog temperaments for obedience and working intelligence, the Bulldog ranked at number 78. That doesn't mean you shouldn't train your Bulldog at all. They can still learn, and you still need to teach them that you are the master. This should only be done with positive training methods and food rewards, because compulsive techniques just won't be effective. The appearance of the Bulldog is often enough to deter unwanted visitors but this dog's temperament also lends itself to being an effective guard dog. Because they bond very closely to their family and they are suspicious of people they don't know, they will bark or growl at any potential intruders until you invite the person into your home. In spite of their size, they can cover short distances very quickly, and a growling Bulldog in attack mode will look quite frightening to any intruder. Aggressive dog temperaments need to be carefully managed in the family home to avoid injury to people and other pets. The Bulldog retains some of their aggressive tendencies particularly around food. They don't like the idea of sharing their meals and will guard their dinner bowl fiercely. This means that your children should be kept away from your Bulldog at feeding time, and if you have any other pets, feed them in another room. Male Bulldogs can also show aggression to other male dogs, particularly if they haven't been well socialized. You can reduce the likelihood of this happening and make sure your Bulldog temperament is accepting of all other dogs by starting them at puppy pre-school at an appropriate age, and by continuing to expose them to other dogs as they grow up. Dog training classes and play dates with friends' dogs are ideal for this. The Bulldog can be an expensive dog to own, as they can have ongoing health issues that need frequent veterinary attention. If you can take this into account, and you are looking for a laid back, affectionate dog that loves being with their family, then the Bulldog temperament might just be the right one for you. The Bulldog belongs to the Non-Sporting Group. The breeds in this group are all over the spectrum when it comes to appearance, and their temperaments are equally diverse. Take a look at the following temperaments of other memebers of this group to get a feel for their personalities. Previous post: Is The Havanese Temperament (Playful, Smart, Affectionate) What You’re Looking For?